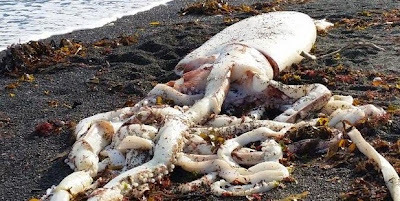 A monster from the deep has washed up on a beach in Kaikoura. 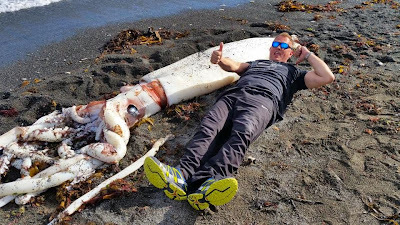 The giant squid, spotted at South Bay, is around 7 metres in length from top to tentacle. Photos of the creature were posted to Facebook by Kaikoura Marine Centre and Aquarium, who said they moved the find "before the birds got to it." "We got help to move it to the aquarium where it is safe inside a freezer," they added. The Marine Centre says the giant squid has a body over 2 metres long, with eyes that are 19 centimetres in diameter. A giant squid that washed up at South Bay, in Kaikoura, on Wednesday, is on display in a freezer at the Kaikoura Marine Centre and Aquarium. Marine biologist and aquarium owner Megan Lewis said the squid was identified as a mature female, but she did not know its age. "They tend to grow very fast and live not very long," she said. Lewis had not yet discovered how the deep sea creature died. Samples had been requested by Auckland and Otago universities and more would be made available to other study centres, she said. The giant squid measured 7.5 metres in total, Lewis said. Its head was 2.23m and the circumference was 1.6m. "The majority of its weight is in the head, which is in pristine condition," she said. "There's no indication of how it died - the stomach was full so it wasn't hungry." She said the squid would stay at the aquarium for the foreseeable future, along with the beak and tentacles of another squid which was found some time ago between Kaikoura and the Chatham Rise.